It's in development somewhat so typos may abound. Feel free to point them out to me. 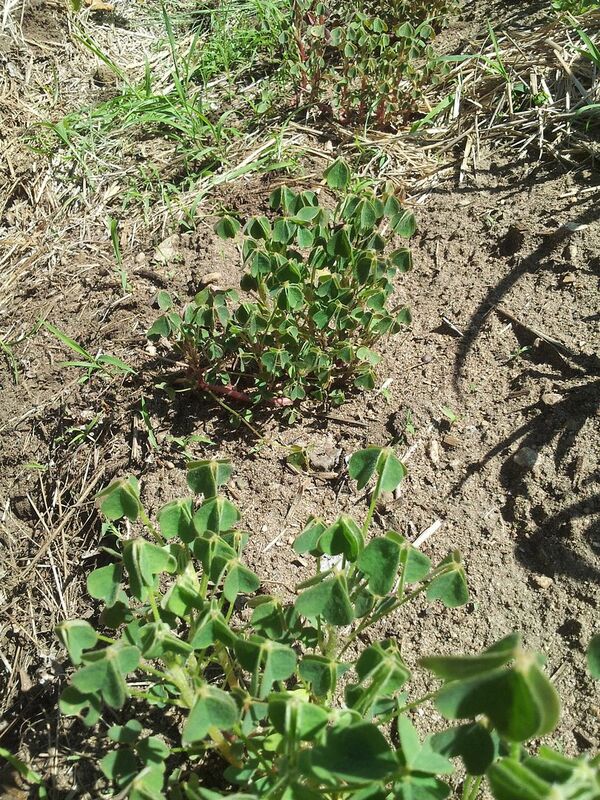 My first attempt to grow oca didn't work out so well but this time worked quite a bit better and was rather encouraging from a crop improvement perspective (not from a holy cow that's an awesome plant that could feed me perspective). 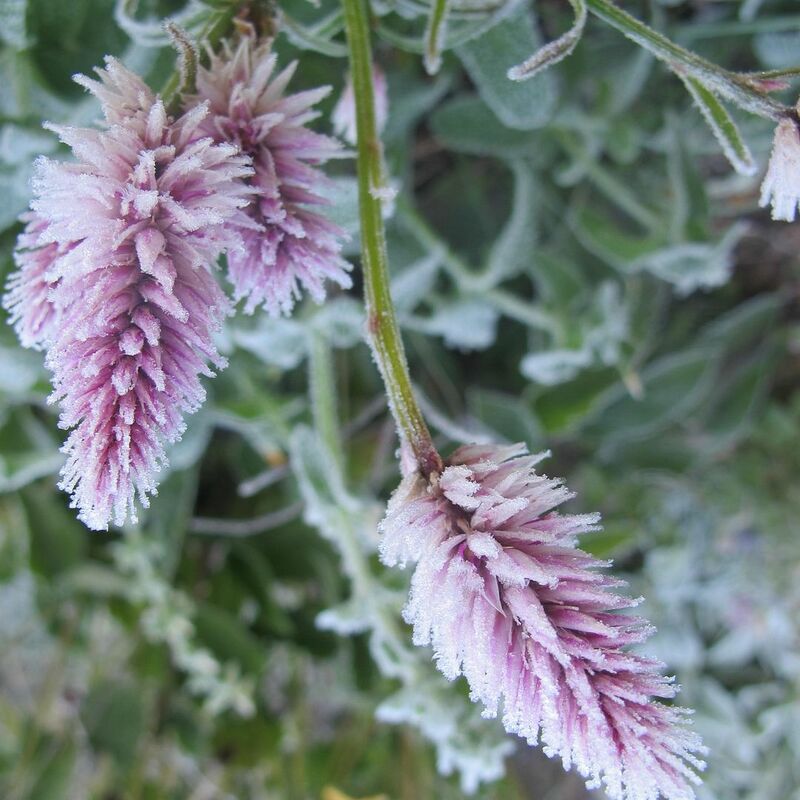 They are a popular novelty crop in maritime climates like England, west coast of America etc..* where they thrive in cool, misty weather over a long frost free season. The tubers, reported to taste like lemony potatoes, don't even begin to form until days shorten in fall but they are killed by frost. Reading that, I thought, "why heck yeah, I want to try that in Ottawa, Canada!" Unhappily putting up with heat and sun. Some common (though technically unseasonable) cold weather hastened my intended mid-November harvest to November 6. I had been covering them with plastic totes during the first frosts: Simple for a short row. So I pulled them and put them in bags and stored them - on the plants with soil - in the garage hoping to redirect some of the fleshy stem goodness to the tubers. 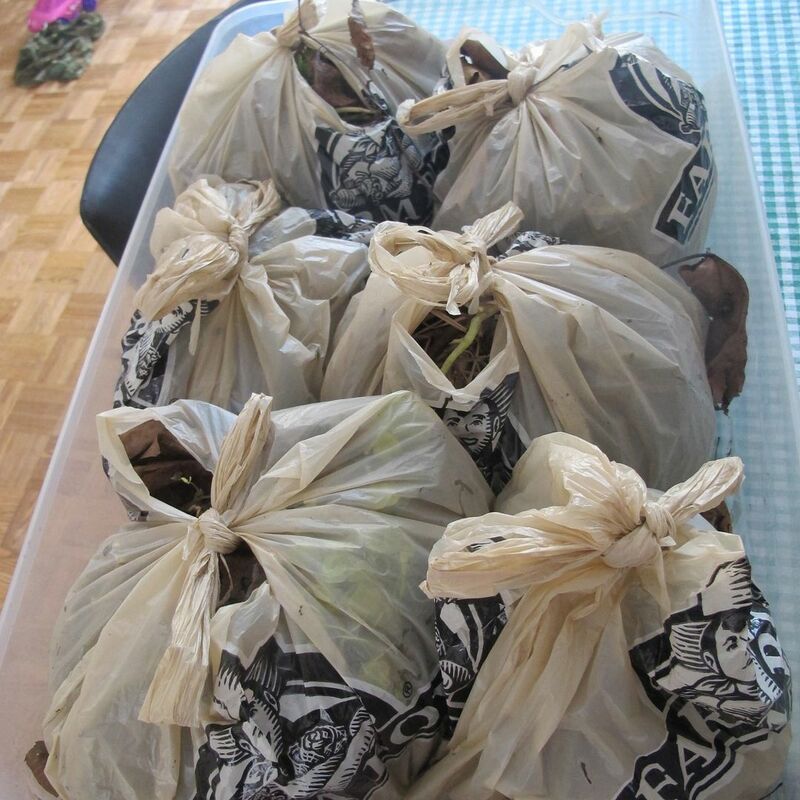 Storing in bags - the whole lot was also covered with a frost blanket. 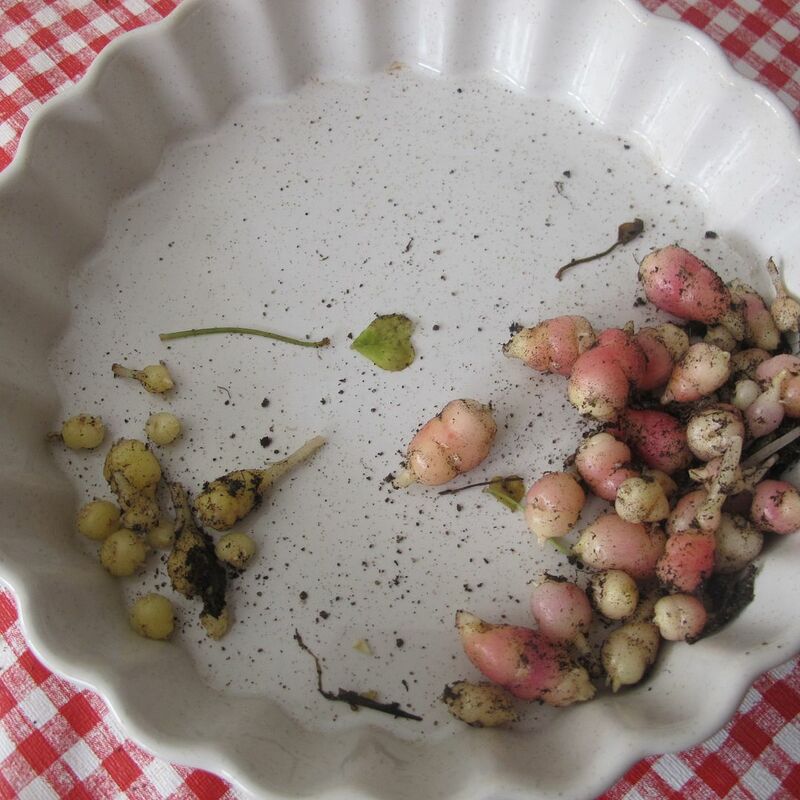 Pink and White seed grown oca. Checking on them today, some of the wetter harvested plant stems were getting a bit mushy, so I decided to pull and compare. As the commercial variety Sunset survived the critter attack, I'm using it as a convenient control. It is a fast-to-bulk variety. The yield from two seedlings that had grown side by side. Dreaming of this weigh scale being filled one day. 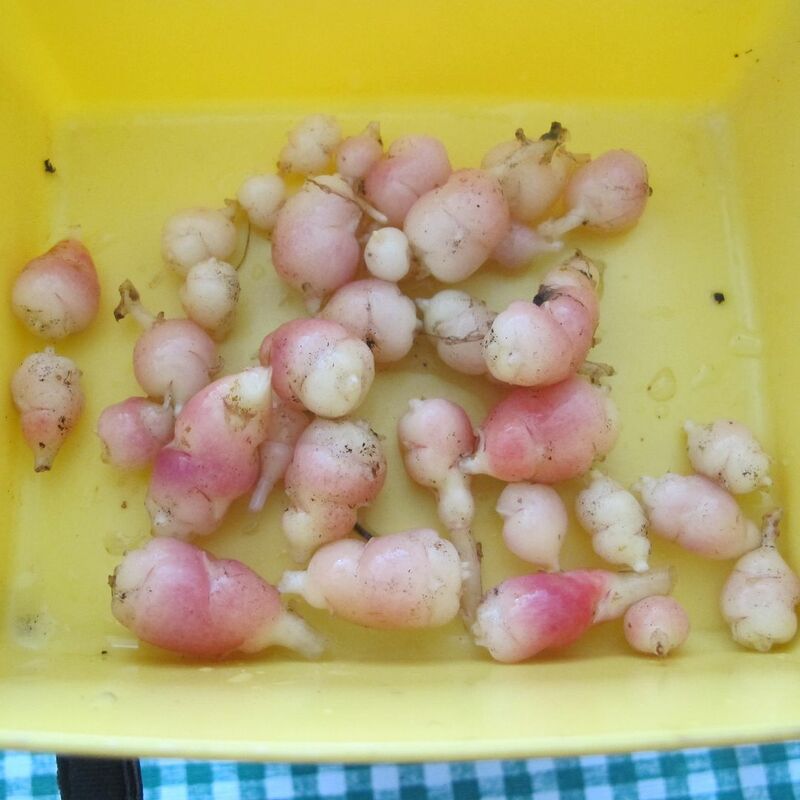 One of the fun things about oca is the variation in tuber colour. Next year, I have some ideas to grow better, bigger plants with hopefully bigger, better yields. 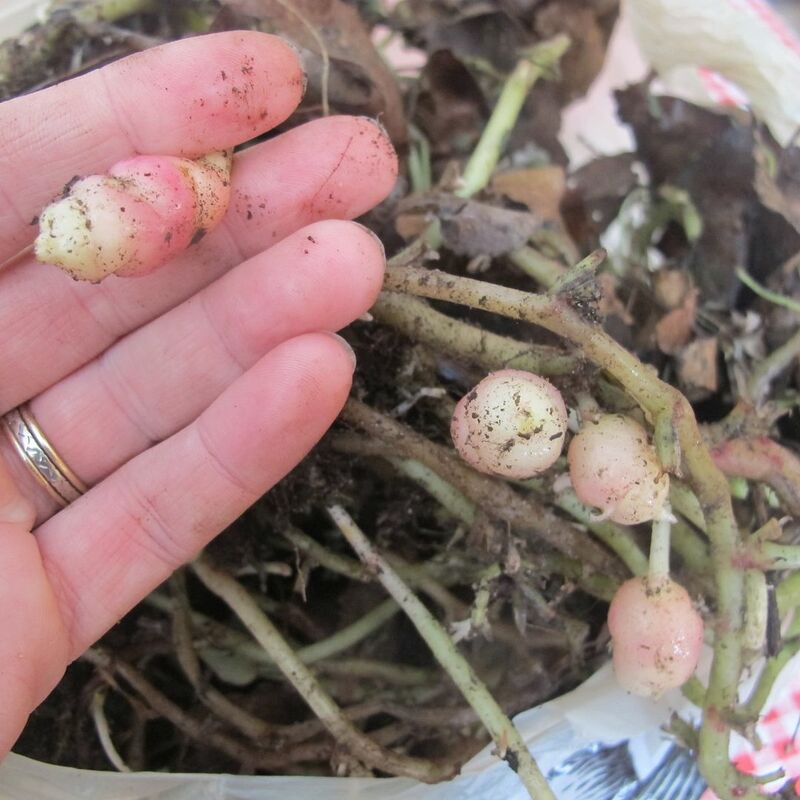 As it is, I found oca fun to grow. 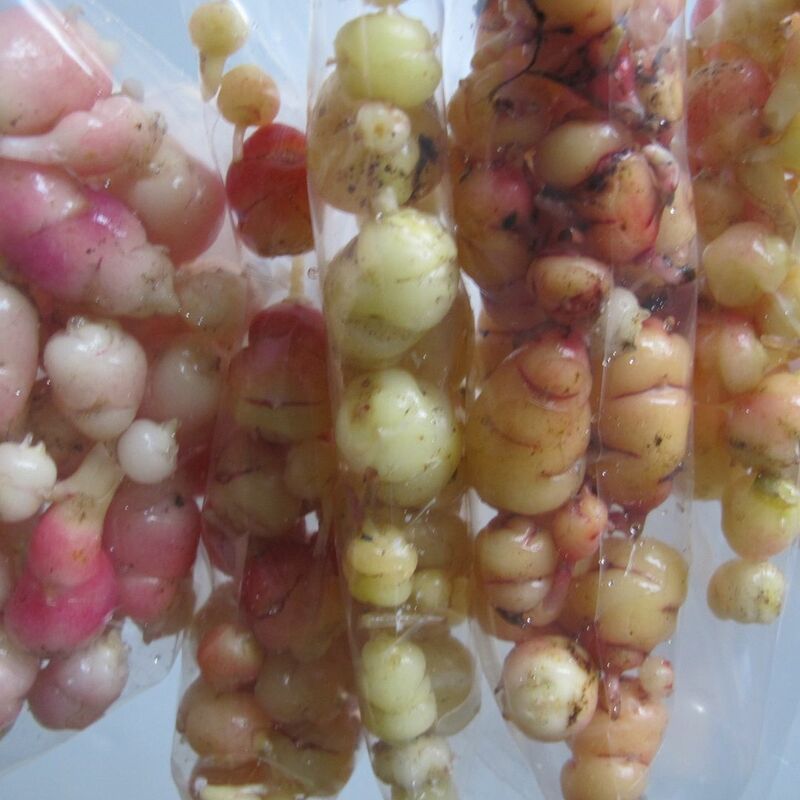 Selection from tubers is appealing as if you get something interesting, it is easy to clonally propagate. P.S. 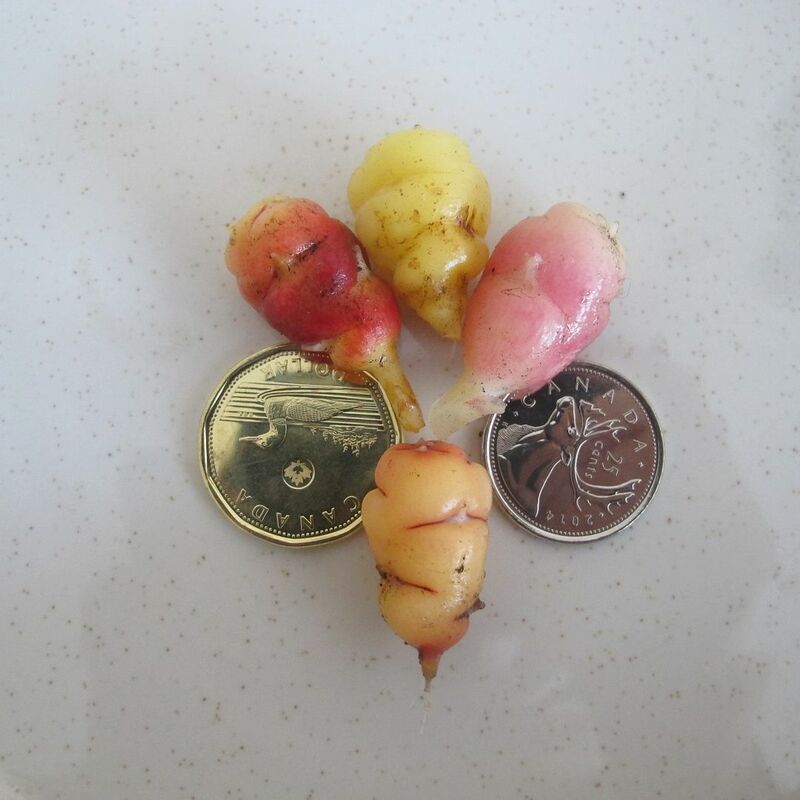 I've heard of several successful non BC Canadian oca growers. 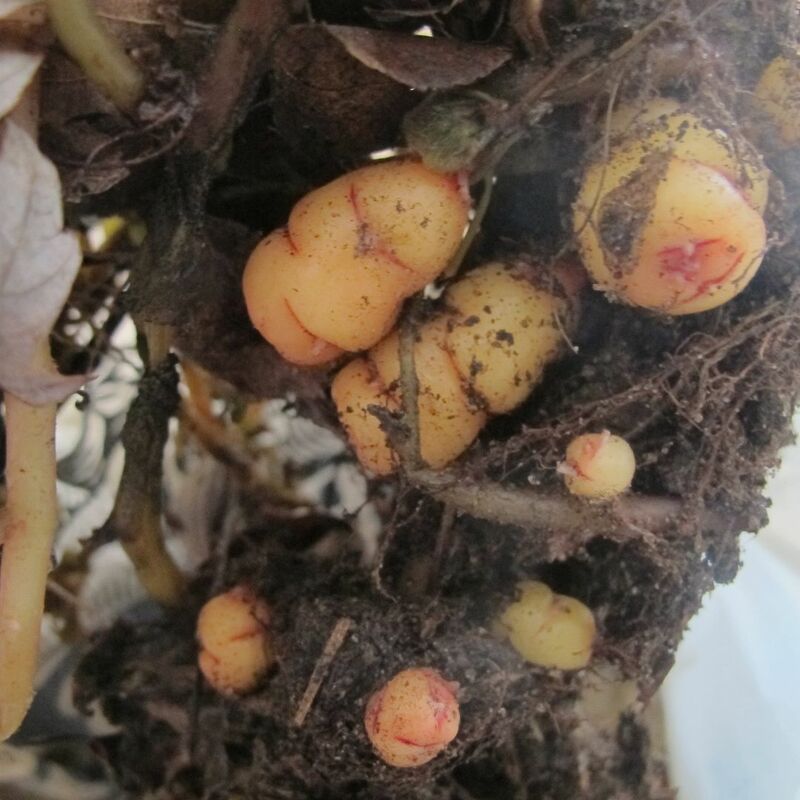 Two live in close-to-maritime conditions favouring oca growth and one just developed this mania this year, growing them in Manitoba! With help from his heated oca-hut, he had quite a respectable harvest. There are also a handful (that I know of) of other crazy folk, like me, in less favourable locations in Ontario or should I say partners in plant exploration. * New Zealand and South America are known to grow a few too. The very slow, roundabout story of how to grow great cabbage. Total time for project: approx. 15 years in 16 easy steps. 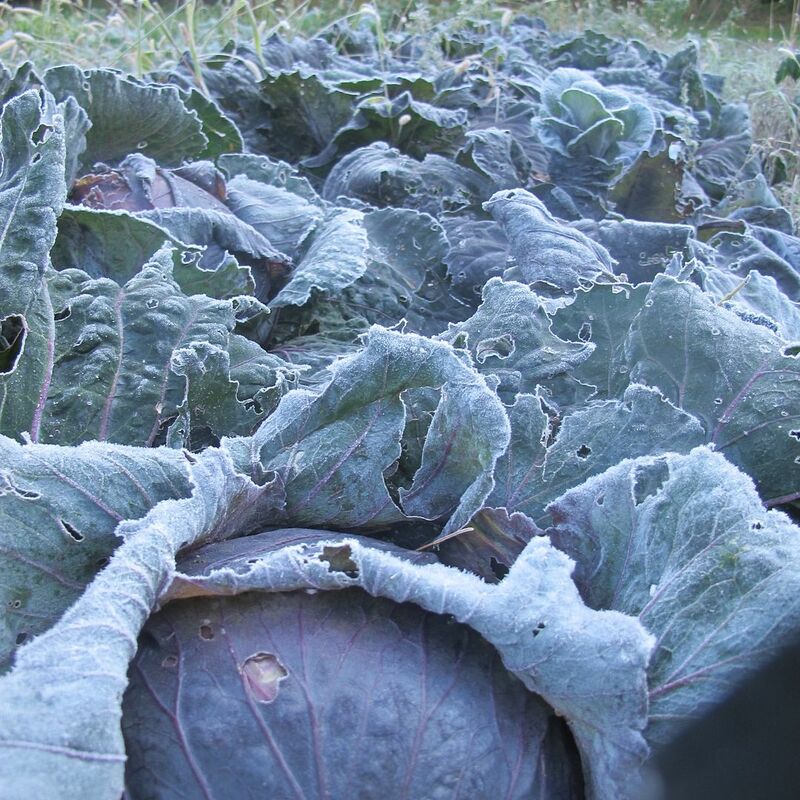 A row of lovely blush cross cabbage after frost. Step 1: Decide that you like cooking and that growing herbs is cheaper than buying them. Step 2: Become suddenly and acutely obsessed with growing anything edible*. 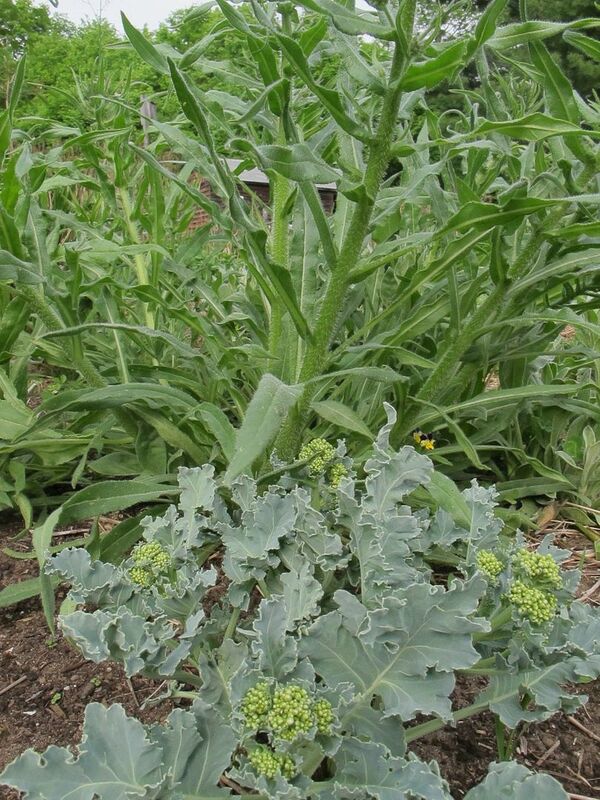 Red Rock Mammoth cabbage and interesting plants like San Michele blush savoy. Step 4: Have mixed success but vow that next year will be better. Time - However long is required to realize that gardening is easy and hard, simple and complicated, beautiful and defeating; That it is worth every minute. It's bigger than her head! It's so big that it was blowing up! Step 5: Finally crack this cabbage growing thing, at least most of the time. Step 6: Start hanging out with seed savers and amateur plant breeders. Time: Varies, may not happen. I recommend it though. Step 7: Have a row of Red Rocks and one lonely San Michele overwinter. 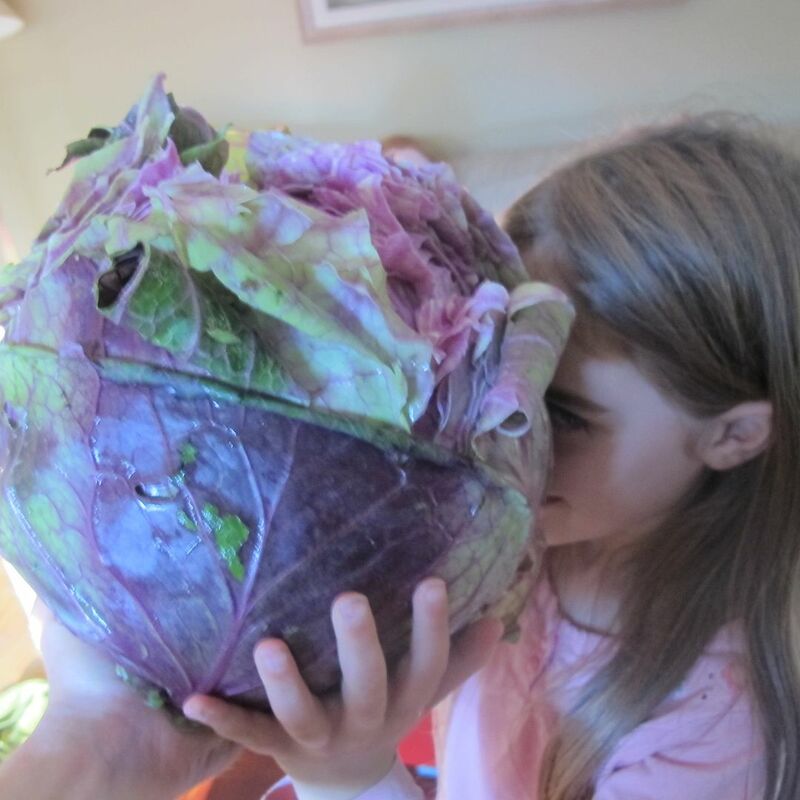 Step 8: Remember hearing something about cabbages being outbreeders and mostly self infertile. Have a sudden idea. 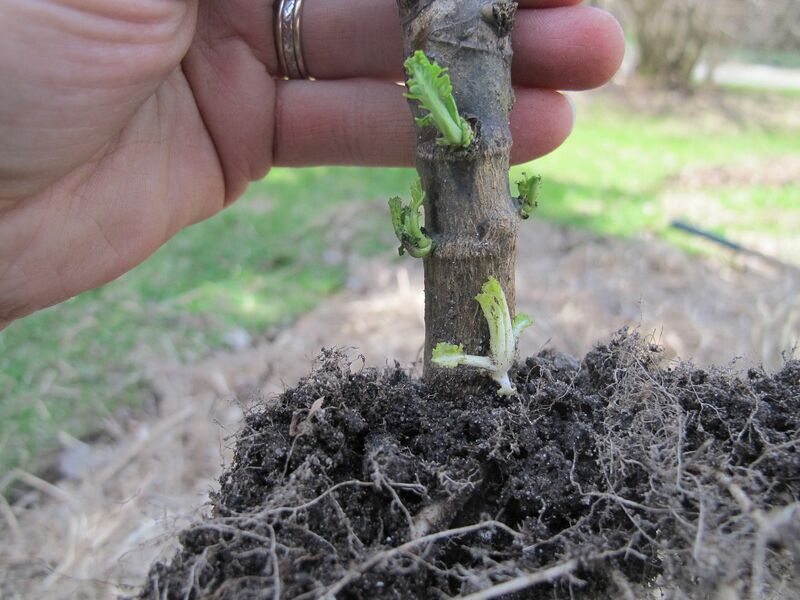 Step 9: Almost lose precious San Michele pods because someone ripped off a seeding stem. For no Reason! Consider stationing guards around the remainder. Get seeds by careful winnowing and threshing. Time: One feverish summer of plant joy. 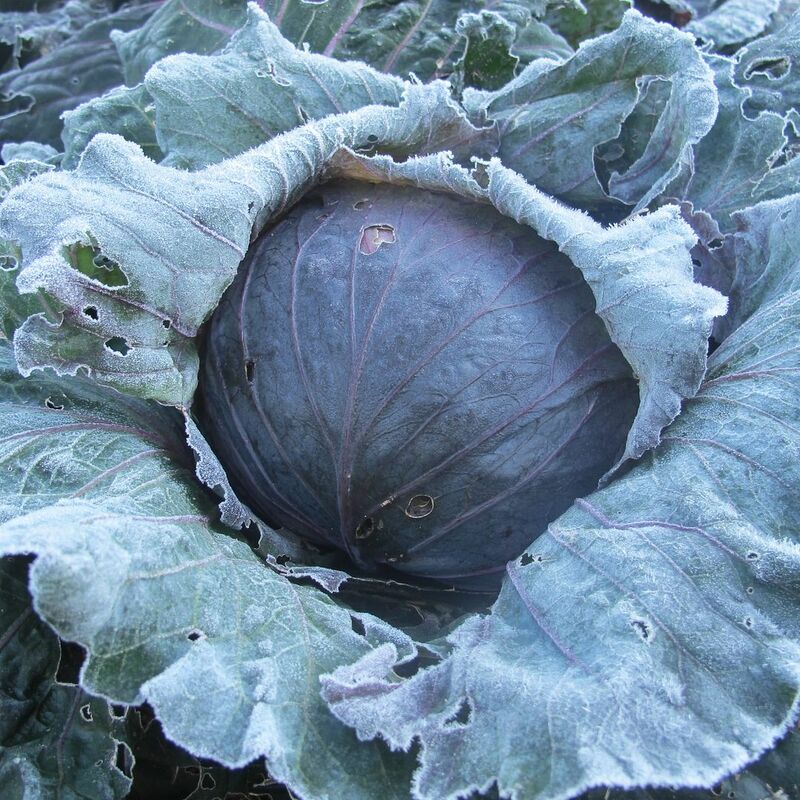 Step 10: Share seeds, grow out cabbage again and again. 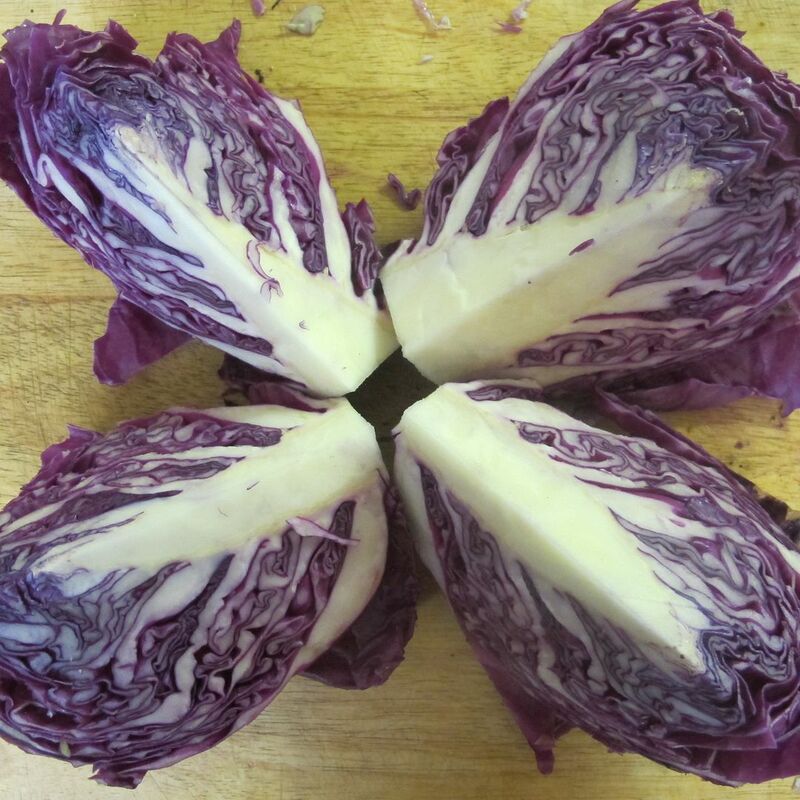 Get wonderful reviews because this is one excellent cabbage. Step 11: Attempt to overwinter f1s. Fail. Time: More than half a year plus many delicate minutes with anthers and stigmas. This is kale, but I've had cabbage survive and resprout. Not only that but I've found that if I bring in the freshly dug roots of cabbage in the spring, they will sprout along the root rather like seakale thongs. Step 14: Let the sun shine, the rain pour and the frost come. Harvest those that are starting to become slimy, split from the rain or just look a bit sad from the constant attack of earwigs, caterpillars, slugs, pill bugs and more. Step 16: Stare at the little jar of f2s seeds with excitement. * I wasn't writing a garden blog back then. In fact, I only started writing a garden blog several years later after my husband (aka non-gardening partner) diplomatically suggested that perhaps I'd like to share my enthusiasm for growing things with OTHER PEOPLE (rather than with him). This post was from my original blog several years after the affliction became acute. ** I don't have a post on this because I abandoned this blog for my gardening friends on Facebook, started a new business, family and other excuses. I did share photos on some edible plant geek sites like Homegrown Goodness (an amazing resource) it seems. 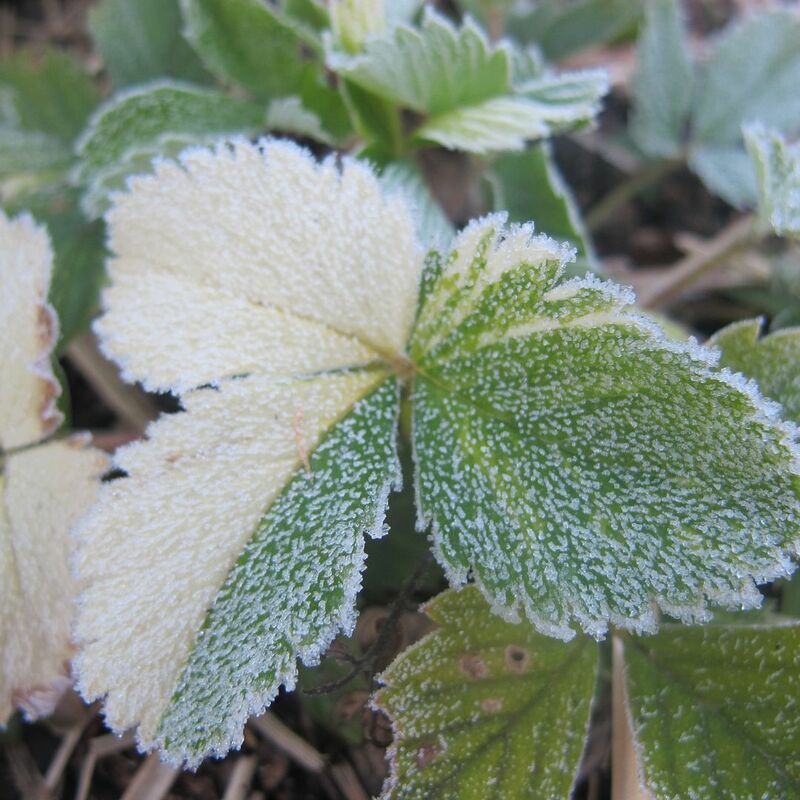 I had a wonderful morning watching the frost add its glistening touch to the garden. 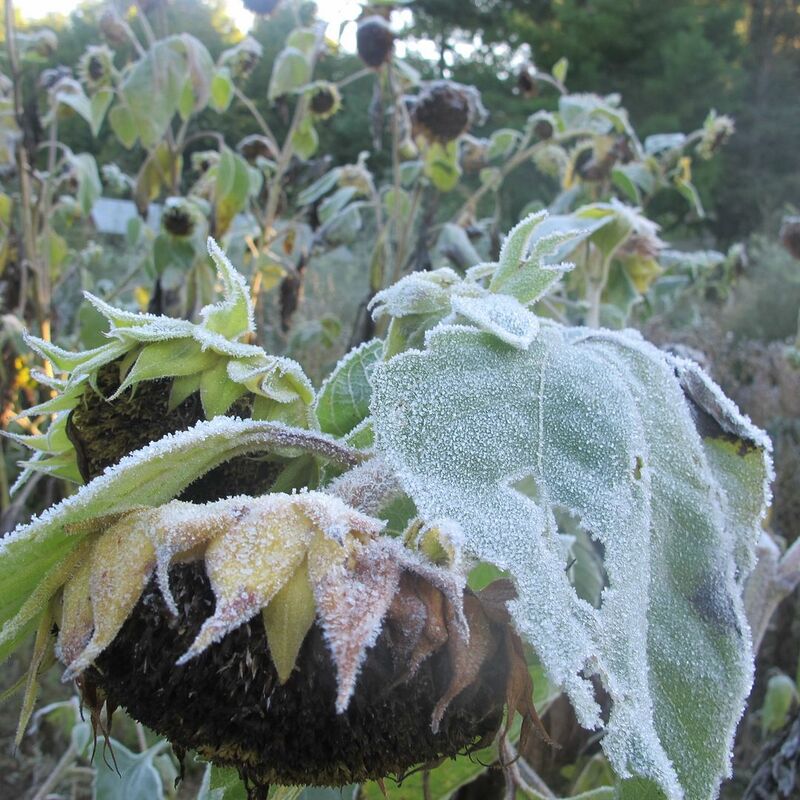 Before the tender plants blackened and wilted, they were caught frozen but perfect. 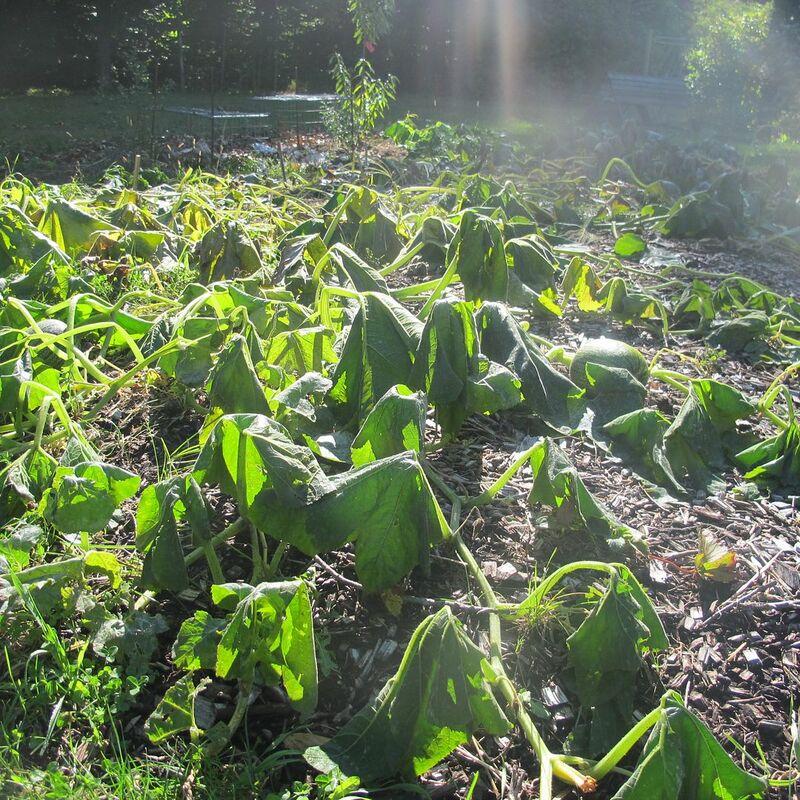 As the sun swept across the gardens, there was a sound like the faintest bells and the drip, drip as the ice melted. Though most of at the frost tender crop had been harvested, I covered some rare root crops that I am trying. The ground was still moist and warm so they were fine. 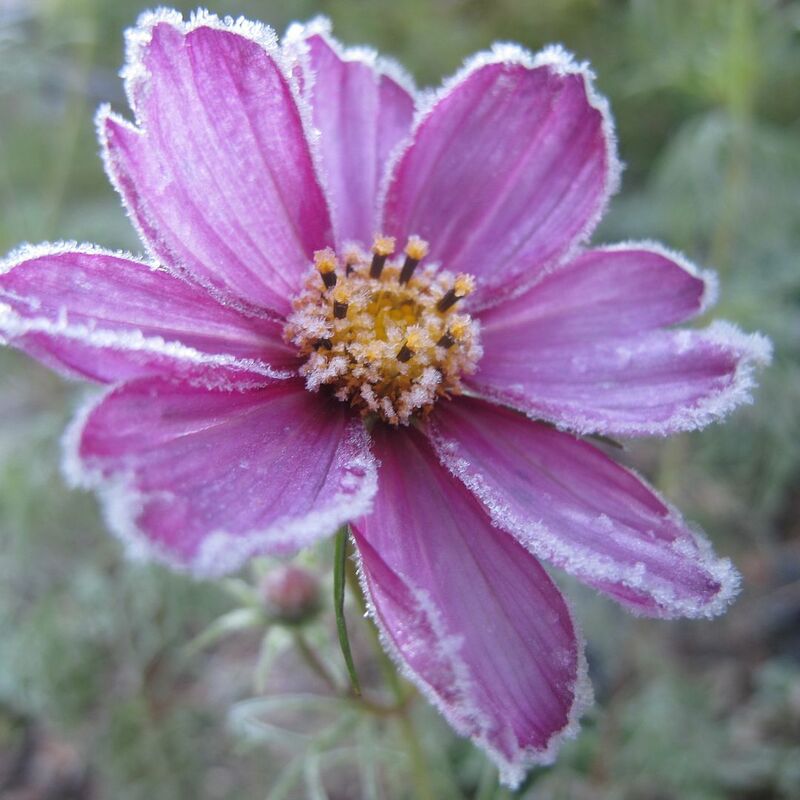 I was intrigued by the dahlias however as frost seem to dance among them: hitting some but not others. 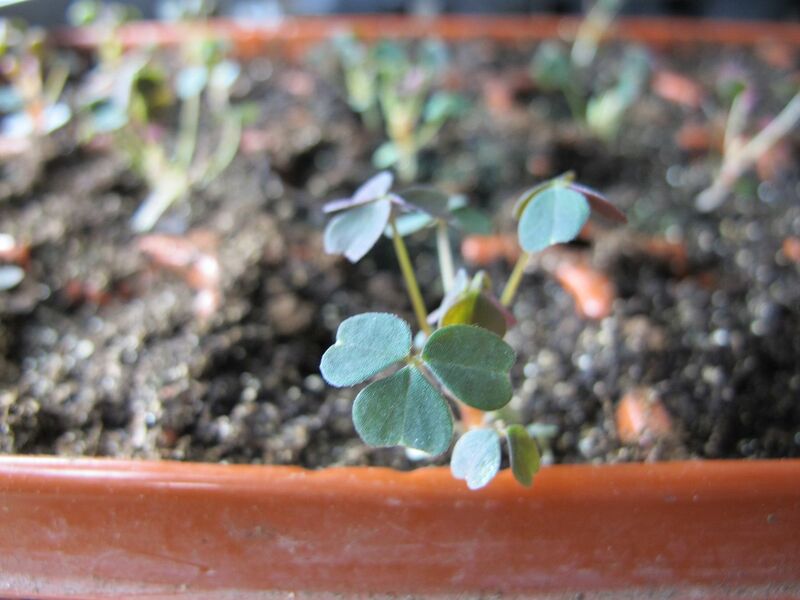 Some of my oca from seed as part of a selection project - both selection for earliness and cultivation tech. 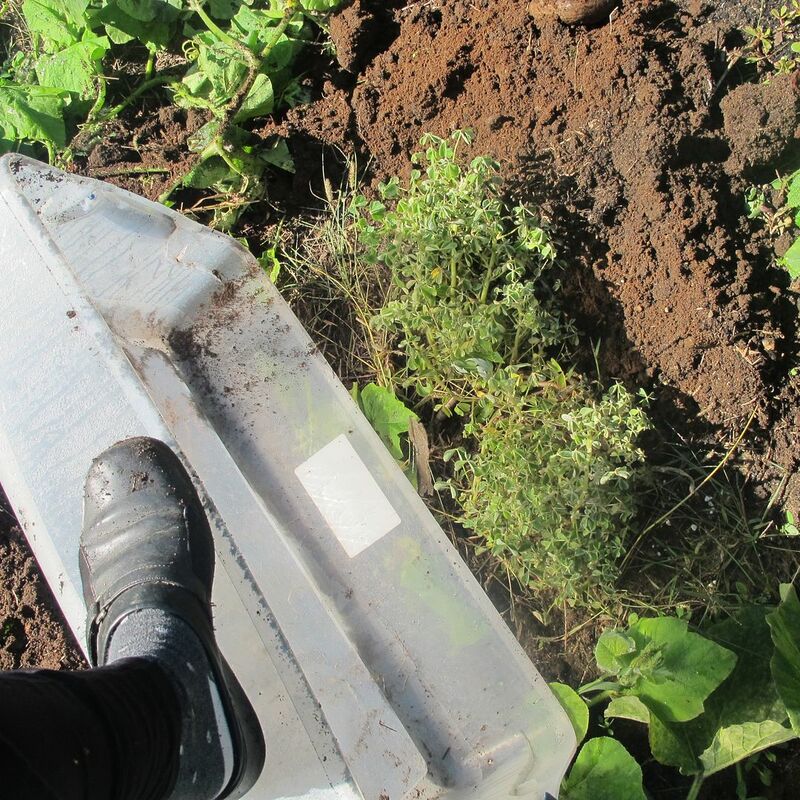 Covered by one of my favourite garden tools: the under-the-bed tupperware container. Litchi tomatoes proved once again that they were tough. 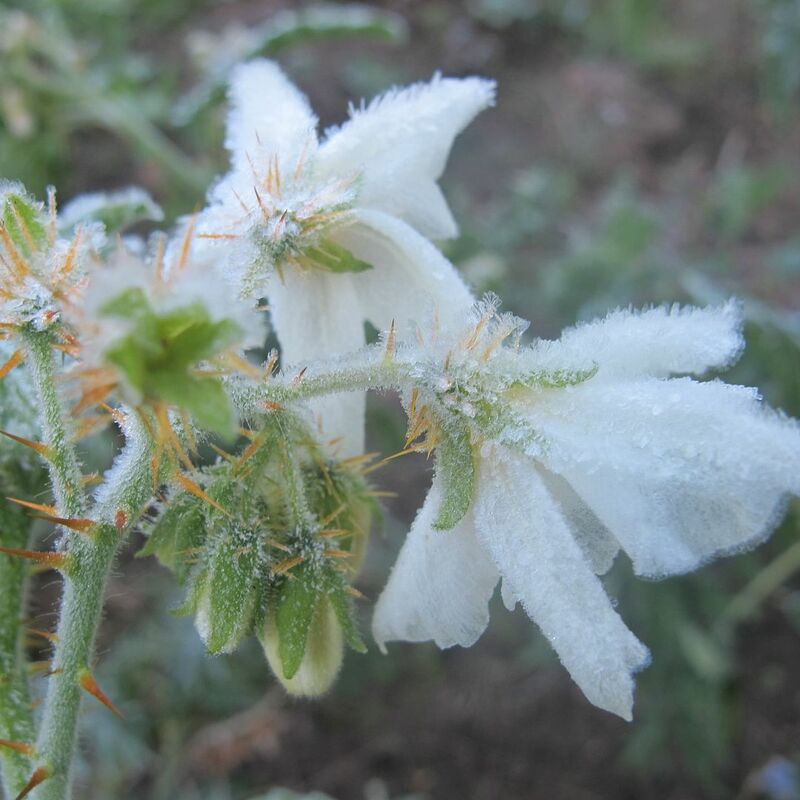 Litchi tomato - not a tomato (though related), not a litchi is mild-frost tolerant. A few hours after frost flowering and fruiting. These pumpkins look to me like revellers awaking to face the next day. I'm very excited (so much so that I actually wrote a blog post) that my dear friend Stephen Barstow is coming to Ottawa for a visit. I've been corresponding and seed trading with him for many, many years. It is a delight to finally meet him in person. Even better is that he is offering to give a talk on his upcoming book Around the World in 80 Plants on Edimentals (edible ornamentals). When I was just a little seedling asking questions or sharing my wide eyed plant joy, Stephen (also known as Stevil on the forums) would be sure to answer with his own joy and generous advice. If ever there was someone who I wanted to write a plant book, it was he. Around the world in 80 permaveggies! Workshop with Stephen Barstow, the man who cultivates 2,000 vegetables in his own garden outside Trondheim in Norway. This workshop will be in the form of a powerpoint talk about 80 of Stephen’s favourite perennial vegetables, including several historic Norwegian vegetables. A number of familiar ornamental perennials that can be used in cooking (edimentals), for example Hosta and daylily. Stephen takes us on a trip around the world from Norway, through Europe and the Mediterranean countries, through Asia, the Himalayas, Siberia, East Asia, South and North America. Many of the plants were and still are local wild foraged vegetables that became domesticated locally. We will hear the stories behind the plants and how they were used in their country of origin as well as experience from growing them in Norway ....many are ideal for the forest garden. There will be plenty of time to ask questions as we follow the plants around the world. Stephen main job is with the sea (ocean wave climatologist) but has in recent years also worked on projects for the Norwegian Genetic Resource Centre, mainly collecting old Norwegian perennial vegetables and herbs! 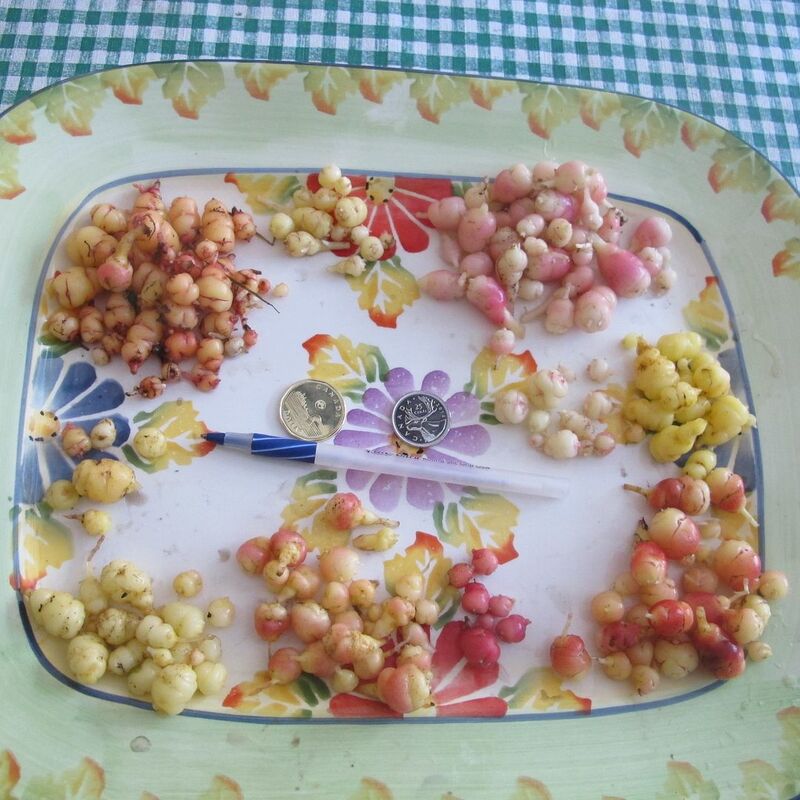 Stephen has led the Norwegian Seed Savers since its start in 2006. This year, I can see, that the forest garden is turning a corner. 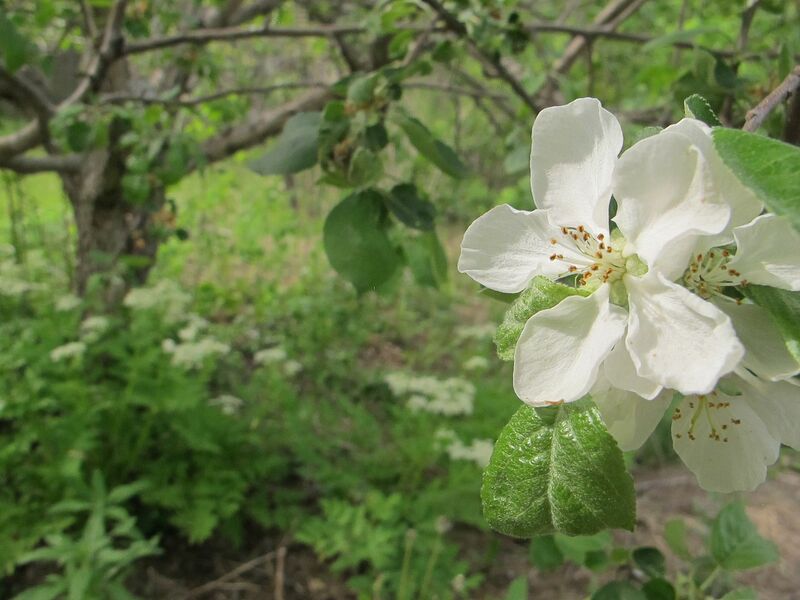 We inherited a homestead orchard containing apples, pears, serviceberry, chokecherry, currants, grapes and plums. It had been tilled and planted up with squash. There was also a tilled veggie patch beside. I have been converting the orchard into a forest garden and the veggie patch into a sunny demonstration garden. 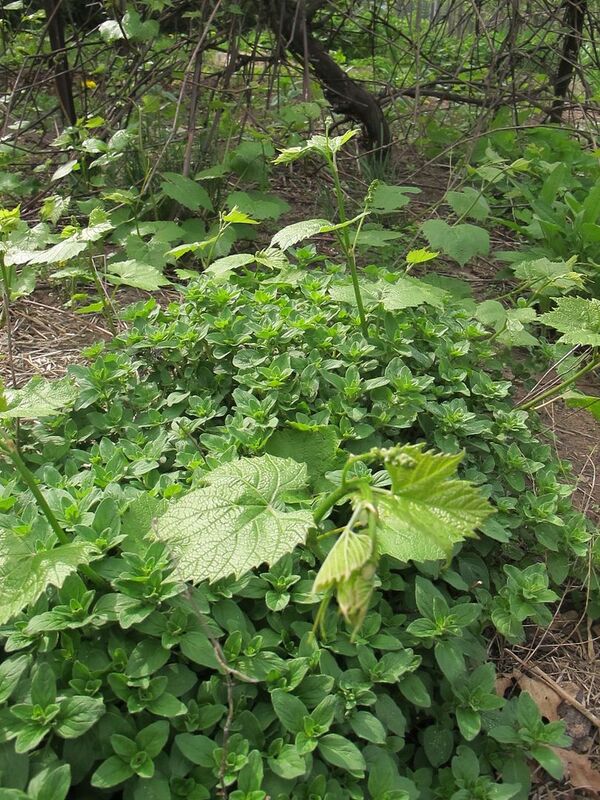 Grape planted with golden garlic (Allium moly), and oregano. Some bread seed poppy (Papaver somniferum) is also making itself at home in the area. 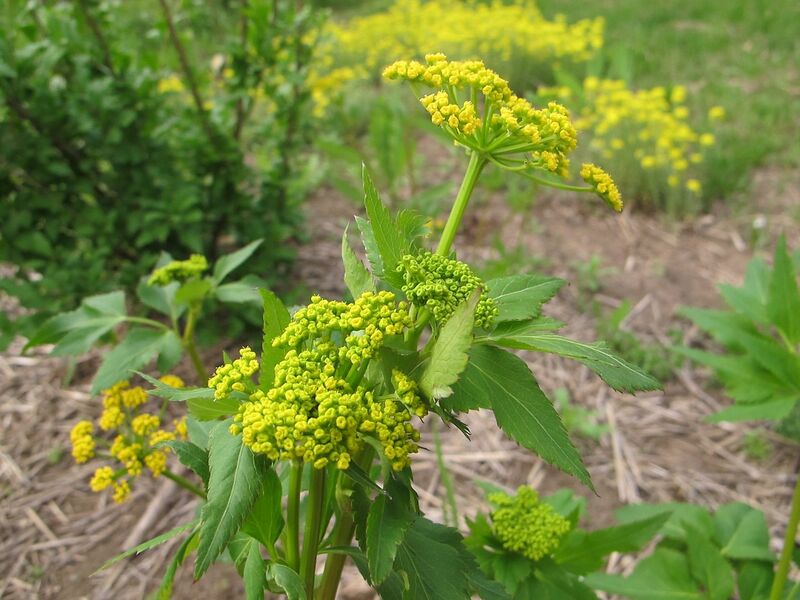 September 2010, I fall seeded a bunch a lot of plants including good king henry (Chenopodium bonus-henricus), nepeta, kale, perennial sunflowers (Helianthus maximiliani), bloody dock (rumen sanguineus), alliums, mustards, chicory, parsnips, lupins and much, much more. Yellow: Zizia aurea and golden alyssum (Aurinia saxatilis) in the distance and goji berry. Season 2011: Wonderful growing season though I did have quite a few brassica flea beetles mid-summer. Little would I know that was my initiation into what was to be the zoo of flea beetles. Garden was expanded. Paths and beds put in. 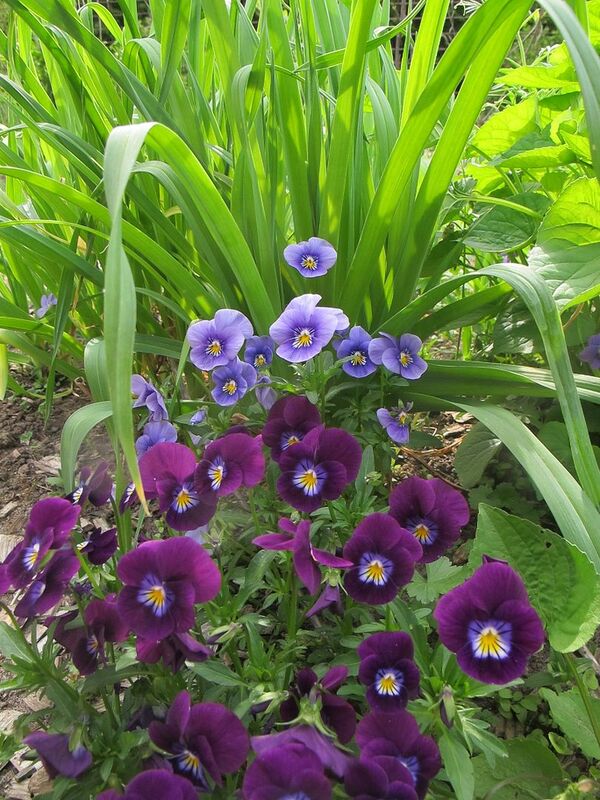 Perennial leek 'Oeprei' with little violets (Viola cornuta) as part of the sunny demo bed. Season 2012: Season started early followed by late frost, once in 100 year drought and hungry pests. Then we added another baby to the family and it finally rained. Garden was messy at best though I did get some produce. Viola odorata 'bicolor' with English daisy (Bellis perennis) and rhubarb. Season 2013: Still ansy from 2012 and with a new baby in tow, I try covering the ground with limited success. A hairless version of Sweet Cicely (Myhrris odorata) beneath an apple tree. On the other side is my tallest Hablitzia and wild ginger (Asarum canadense) too. 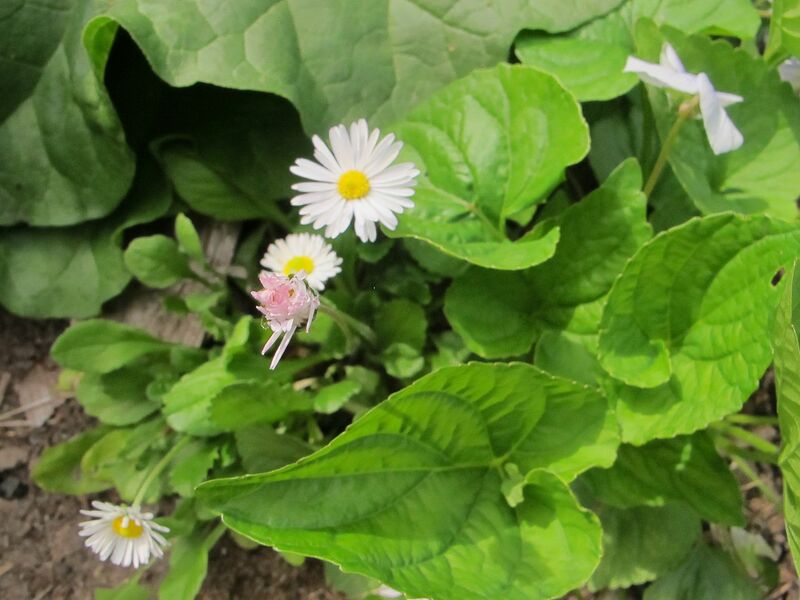 Season 2014: Perennials like Blue chives (Allium nutans), buckler leaf sorrel (Rumex scutatus), hablitzia, walking onion, rhubarb, strawberry spinach (Chenopodium capitatum), patience dock and more are really starting to shine. The ground is growing more edibles, beneficials and beauty than it is weeds (which have their edible, beneficial and beautiful side of course). I feel we have turned a corner. I rather like how Seakale 'Lilywhite' (Crambe maritima) and Blue Alkanet look together. I imagine they'll be even more spectacular in bloom. 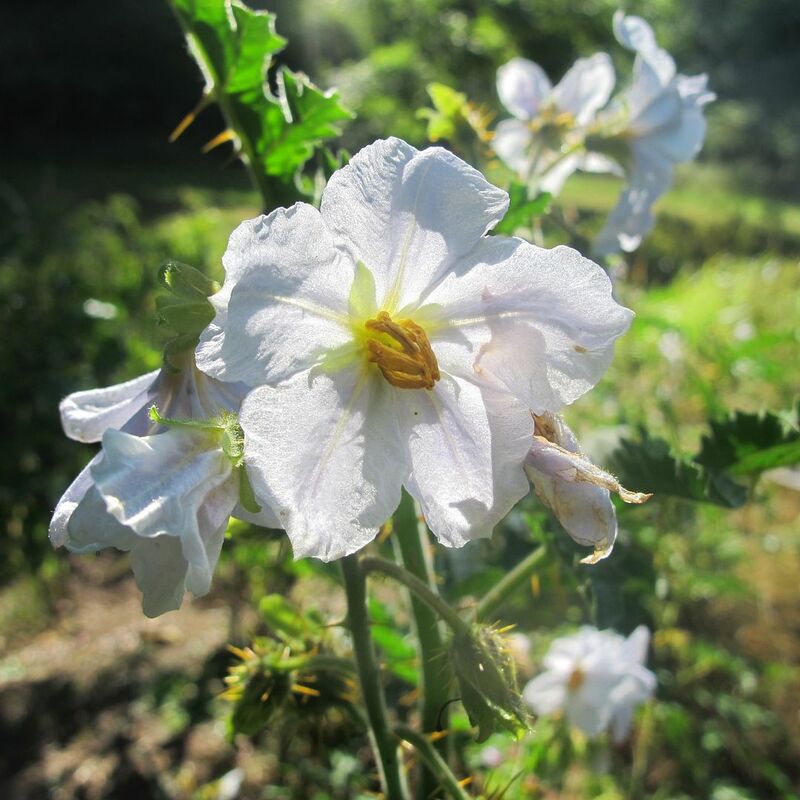 I was happy to see good survival of soldier mallow, poppy mallow, monkey flower, and overwintering of roots like turnip, fennel and parsley for seed. Lots of new plants to the garden too like udo (Aralia cordata), Beetroot bellflower (Campanula punctata) and variegated daylily (Hemerocallis sp.). Any plants that don't go in nursery sales this year, will be planted either in propagation beds or in the forest garden proper. The forest is really filling in now! I feel like one of those bloggers that's falling into the trap of constantly apologizing for why they haven't written in a while. I wish instead that I could put together pretty pictures into the posts I plan in my head while getting plants ready to go to market, edging and weeding the garden, harvesting and making stuff and taking care of the food. Sleep? Don't be silly. No time for that. May 25: Kids in the Pumpkin Patch Begins! June 1st: Join us for a morning of fun in Kinburn. Morning we plant sweet potatoes. Afternoon we talk figs with Thyme to Cover. And more throughout the summer! copyright: me. Simple theme. Powered by Blogger.